I have been devoting so much time to my latest passion (writing mystery/thrillers set in the Canadian wilderness) that my blog has suffered neglect. So I have decided to start a new series of short posts that will document my love affair with the Canadian Arctic and far north. What better way to start the day than by reaching into my grab bag of treasured memories and sharing them? While I write this at 0700, I am listening to my favourite music (Beethoven Trios this morning) and reliving a moment of joy. No photo sums up my arctic experience better than the one above. 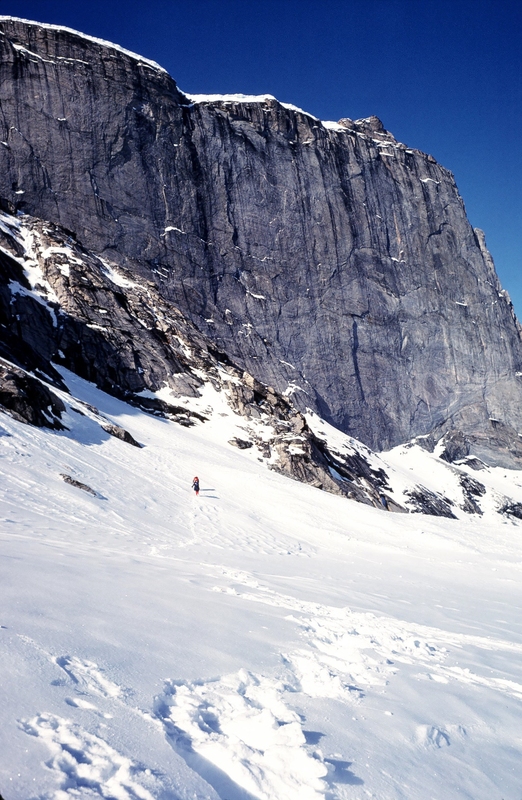 In 1979, the Alpine Club of Canada held a climbing camp at Ayr Lake near Clyde River on Baffin Island. With twenty-four-hour daylight, normal routine meant nothing, especially as we were in a wilderness that we would probably never visit again. 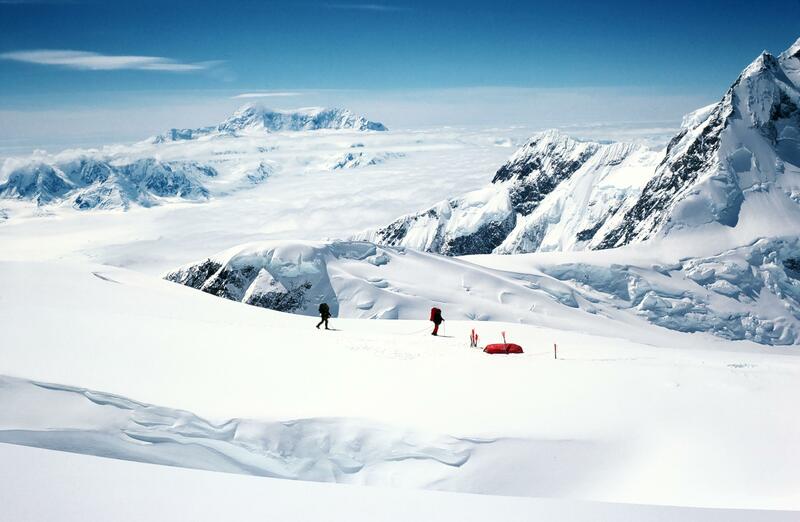 Two other women and I left our base camp in mid day and skied into a land of magic. What lies over the next pass? Has anyone ever stood on that summit we see on the horizon? And so we continued for perhaps twenty hours. We weren’t climbing granite walls or trying to establish new routes. We just wanted to explore and experience this world that was so new and strange to us. It was well after midnight when we saw this glacier-capped mountain in the distance, shining clear in the light of a full moon. It seemed to be issuing an invitation. And of course we had to climb it. Very few of my wildest moments have been preserved in photos (for example, my rodeo exhibition on a spinning horse in Mongolia, or the mad dash to chase down a cartwheeling tent on the Dais Glacier, or the exploding coke bottles on the same glacier, or the failed igloo on the Wapta Icefield – these exist only in my memory). But my photo collection does give some idea of how adventure can be gently amusing or downright ridiculous. Herewith my favourites. He can't quite reach the stirrups. 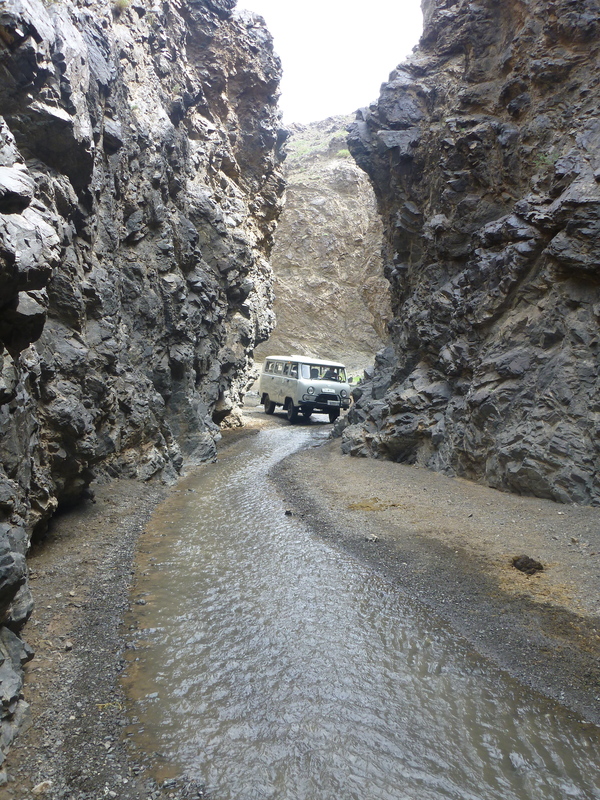 This is what passes for a road in most of Mongolia. 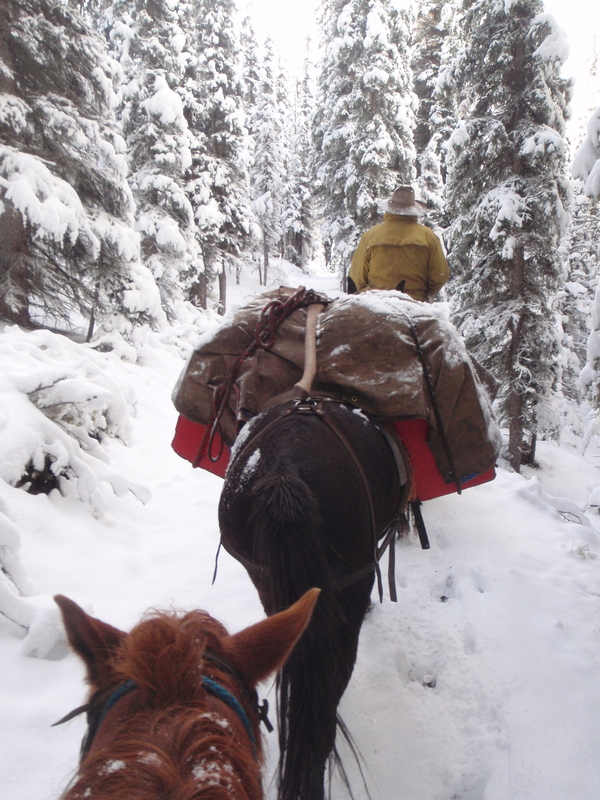 This photo was taken on the sixth day of rain and snow on a horse trek in Banff National Park in September. Sometimes a little push is needed. And sometimes you need a big push. 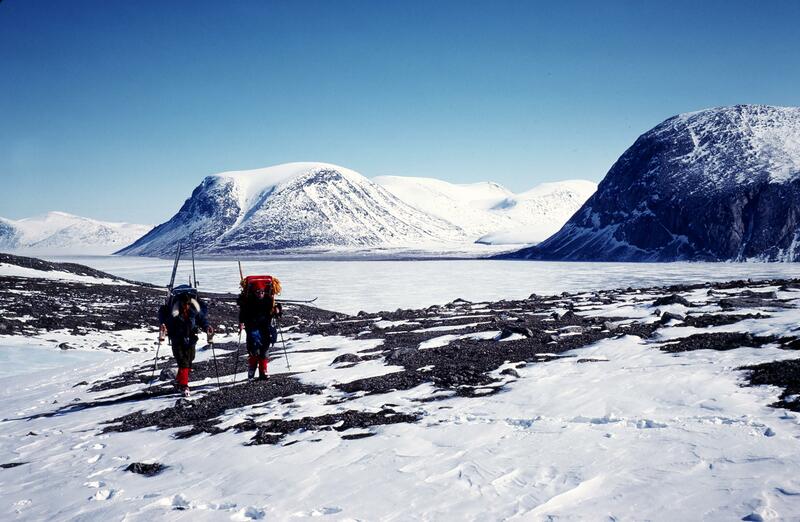 Heading for Summit Lake, Auyuittuq National Park, Baffin Island. All dressed up and where are we going? 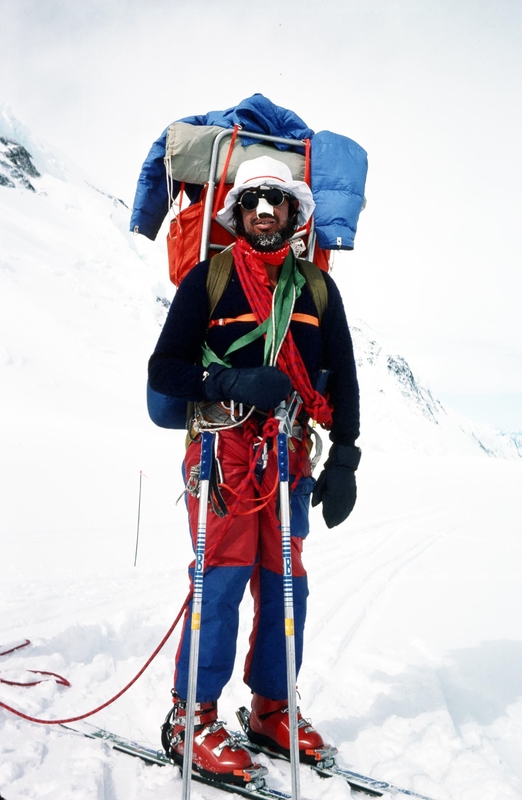 John ready to face the elements on Mt Logan. This may be the silliest I have ever looked. This one has no rival. At this point I had had just about enough cold and wind in Auyuittuq National Park, Baffin Island. Having wonderful time. Wish you were here. Waiting out a storm on Mt Logan. 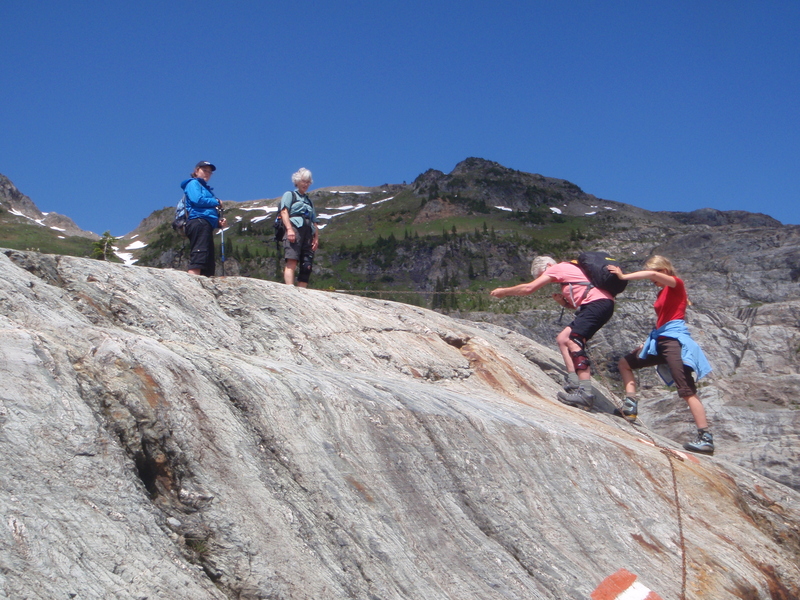 Actually, this camp on the Dais Glacier, British Columbia, was a lot of fun. Because our pilot allowed 100 lbs of gear each, we had all the comforts of home, not to mention beer, wine and exploding coke bottles. We don’t always realize that a stage of our life is coming to an end. 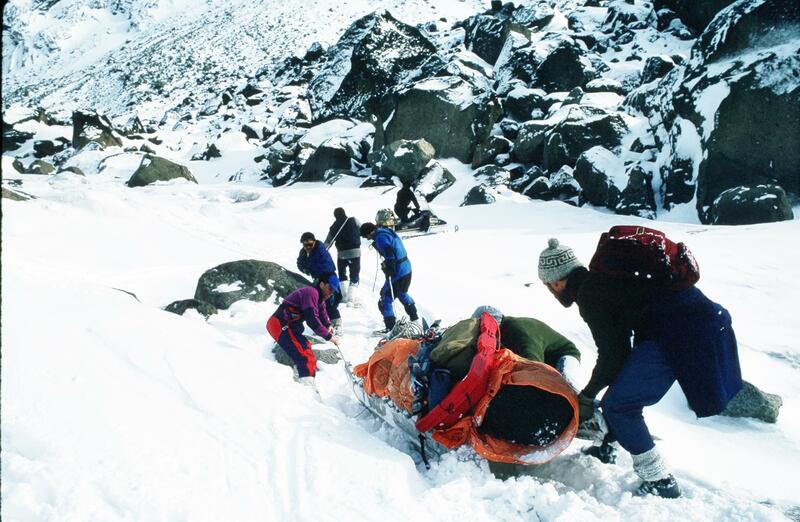 From 1967 to the early 80s I had been spending every available moment in the mountains and was pursuing a goal to do easy high altitude climbs. Two events changed everything: I met Mike, who would become my life partner, and I climbed Huascaran, the highest peak in Peru and the highest of my career. Following a wonderful month-long trek over Inca trails, ending at Machu Picchu, I embarked on a month-long expedition to climb Huascaran with Mountain Travel. When I got home I discovered that my camera had malfunctioned; the loss of my photos was devastating. 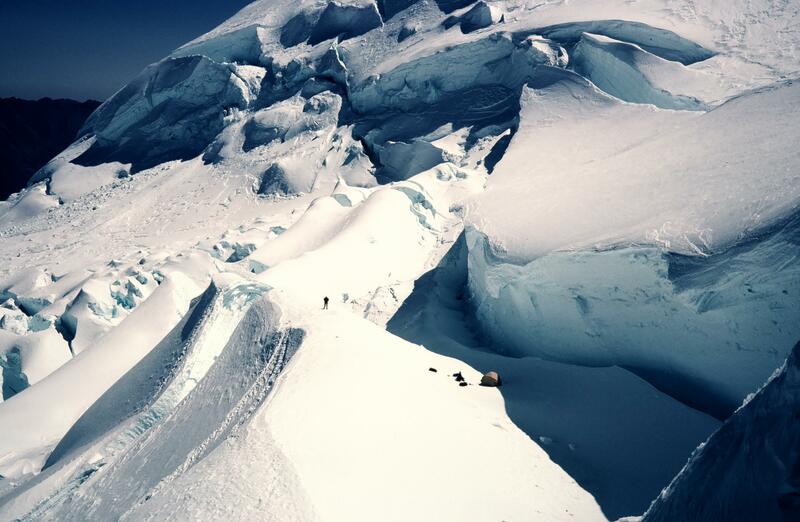 Nothing remains from the Inca trek, but fortunately our leader on Huascaran kindly sent me some excellent shots of our climbs, which I use here. 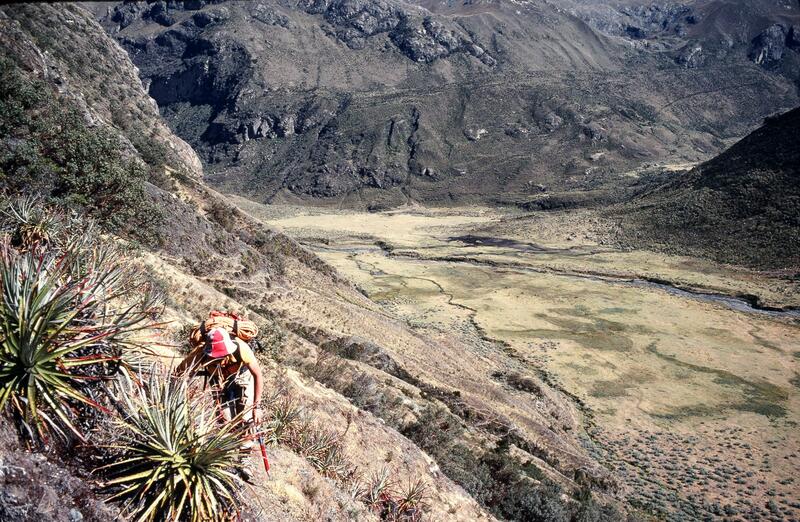 You don’t set off for 22,300 feet without first acclimatizing on some lower peaks. We camped in the valley seen far below, where a herd of cows destroyed one of our MSR stoves (the only MSR stove I have ever seen that was not field reparable). Was that an omen of our future troubles? Next day we climbed this dry hillside to place a high camp. Heading for our first climb. Our expedition almost ended here. One of the guys (we were a party of 4) tried to burn his toilet paper, starting a wildfire that threatened to consume us. No camp ever came down so fast! We quite literally ran for our lives until we reached rocky terrain. The climb itself seemed anticlimactic, the most difficult part being the fiendishly steep dirt we had to surmount in order to reach a rock ridge. Me on the rock ridge. And what was our objective? This! We called it the Ice Cream Cake. Despite its appearance, the back side was an easy snow slope. Our next climb was more challenging. Approach to our next climb, seen in background. 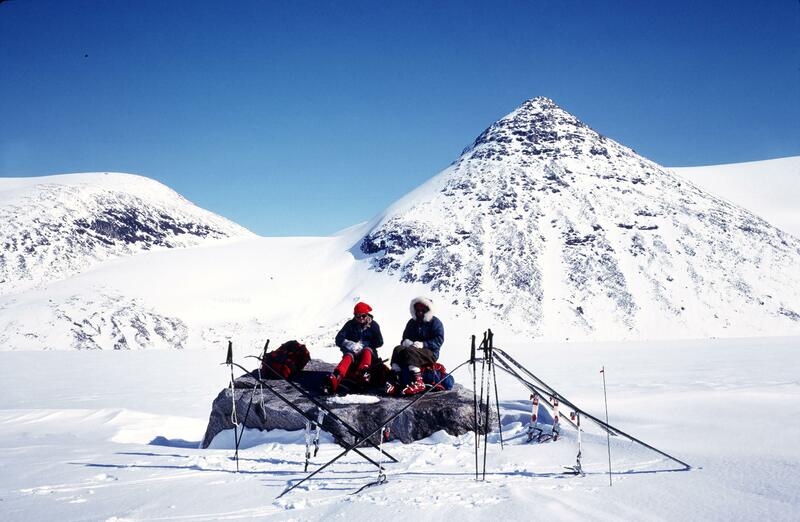 Our intent was to place a high camp on the col and make the summit attempt from there. Getting to the ridge involved a pretty spectacular glacier climb. Looking down to the location of our high camp I could also see the enormous challenge that awaited us on the morrow. That night bad weather moved in, forcing us to retreat. We would need all our remaining time for our main objective. 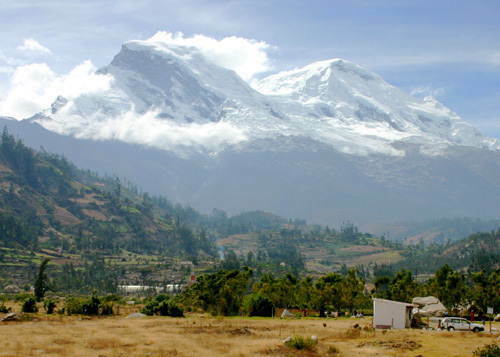 Huascaran is a mountain steeped in tragedy. 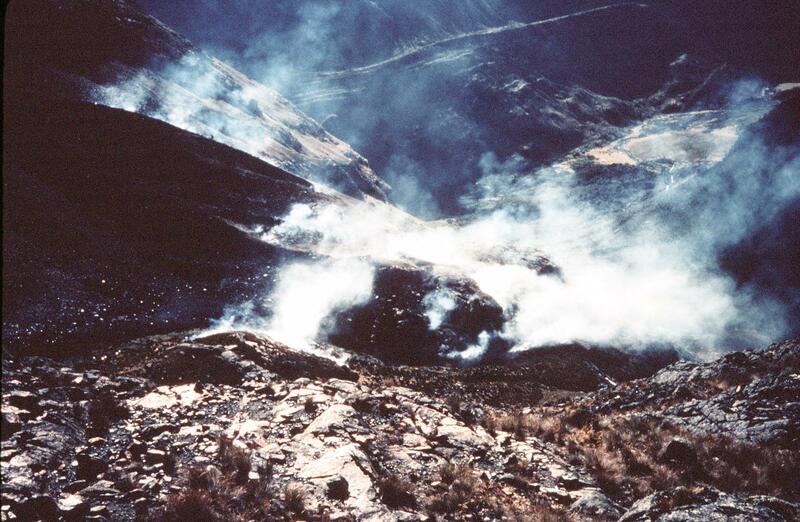 It has claimed many lives, only a few of them climbers; 20,000 people died in 1970 when an earthquake set off a massive landslide, burying the village of Yungay, and thousands more died in earlier slides. When we passed through Yungay we knew we were walking on a mass grave. 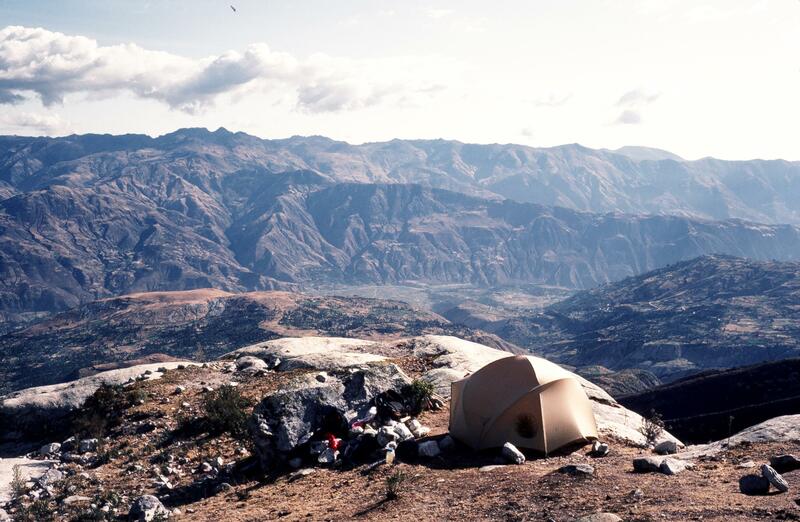 Getting to Huascaron base camp involved a long slog, but the view is worth it. We hid some gear there in what proved to be a vain hope that it would still be there on our return. The next few days saw sunshine and blue sky grace our route up heavily crevassed glacier, the warm rays offering some relief from the constant wind that threatened at times to stop us in our tracks. At one point an avalanche roared down toward us. We could see the cloud of snow approaching, but had no idea where the main body of the avalanche was. All we could do was drop into self-arrest position and hope. Fortunately all we got was a dusting of snow. Then the problems began. We had to pass beneath a giant icefall, where blocks of ice the size of a house lay all around us, dire evidence of what lay above. Climbing out of this area was fairly technical, but our leader provided a fixed rope. Then the storm hit. One of those storms where you spend the night with feet and arms braced against the tent poles to keep the tent from collapsing. The storm lasted two days, and the only benefit was a relief from breakfasts of chicken noodle soup. For some reason, our leader did not believe in climbing on granola, but at least he had brought some, which we finished off pretty quickly, along with most of the candy we had. When calm weather returned we continued. The scenery became increasingly spectacular. Our high camp was on one of the most awesome perches I have ever occupied. Summit day. 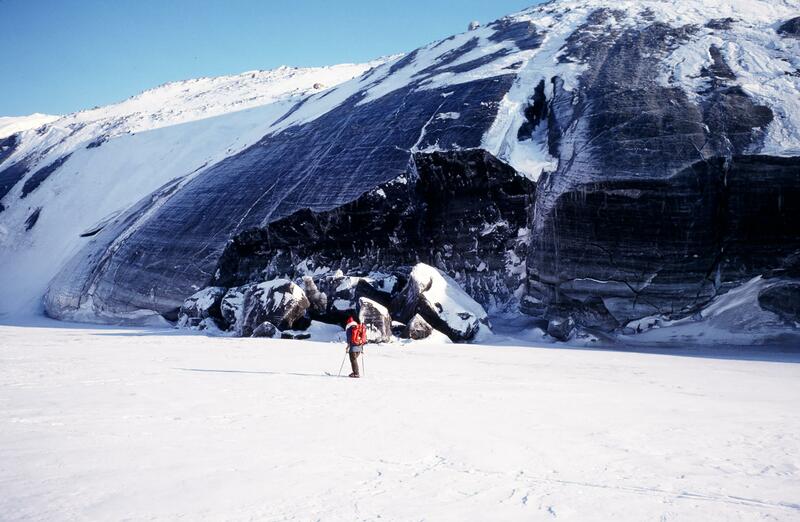 We ingest some chicken soup and head into and up the far side of the huge crevasse beside camp. We are already too high to move quickly as we slog up a long, steep snow slope, only to find our way blocked at the top by a crevasse. As we retrace our steps we see another party ascending, but they are to far away to warn. We later learn that they took a long fall on the way down and had to abandon their climb. We take an alternate route, pausing briefly to eat a few yogurt-covered raisins. Then up and up as the day drags on. By late afternoon we are faced with a tough decision: the summit is in sight but still a long way off. If we turn around we will get back to camp before dark. If we keep going we risk being caught by darkness high on the mountain (as we are near the equator there will be no twilight). I feel strong and exhilarated, as I usually do at altitude, but I know that my brain is functioning oddly. Still I think, “I’ve come so far. I’ll never be back here again. Let’s go for it!” Did I persuade the others, or were they also thinking the same thing? We decide to keep going. At last, the final slope. 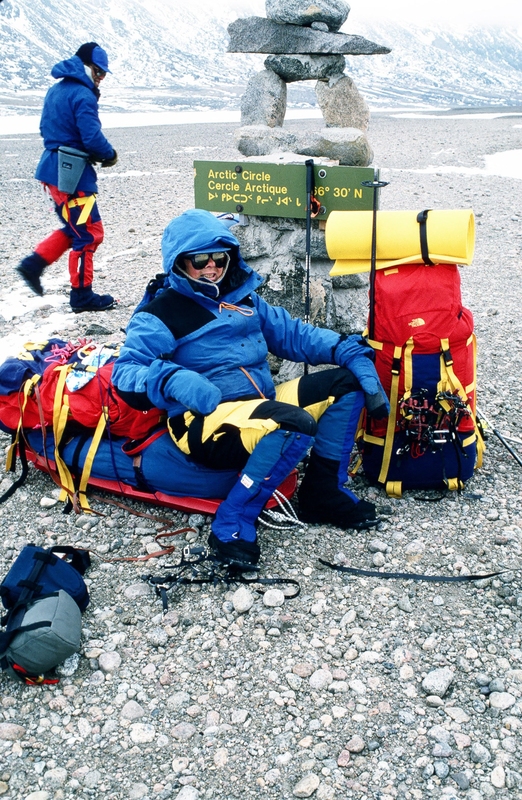 Ed Viesturs, one of the great Himalayan climbers, has said, “Getting down is not an option.” It’s a principle I had always followed in my climbing – until summit day on Huascaran. When I had time to reflect on the expedition, I realized that my brain was not working right at 22,000 feet. I had risked everything for what? Another summit? 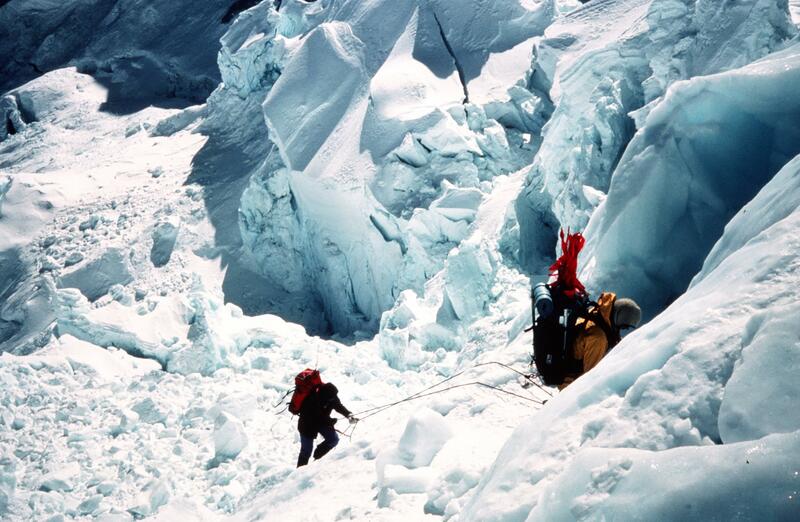 Objective dangers, like avalanches, icefalls and crevasses, are part of mountaineering. Bad decisions should never be. There were other mountains as high or higher than Huascaran that were on my to-do list, but I knew that I should not attempt them. 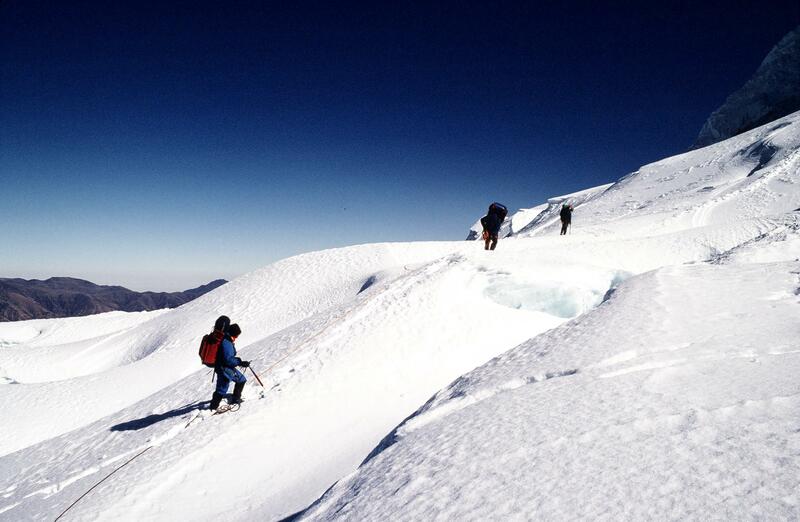 So, although I went on to do a few climbs near 19,000 feet, Huascaran became my farewell to high-altitude expeditions. Indeed, after Huascaran I did a lot less climbing, not because I loved it less, but because in Mike, my life partner, I found a reason to spend more time at home. 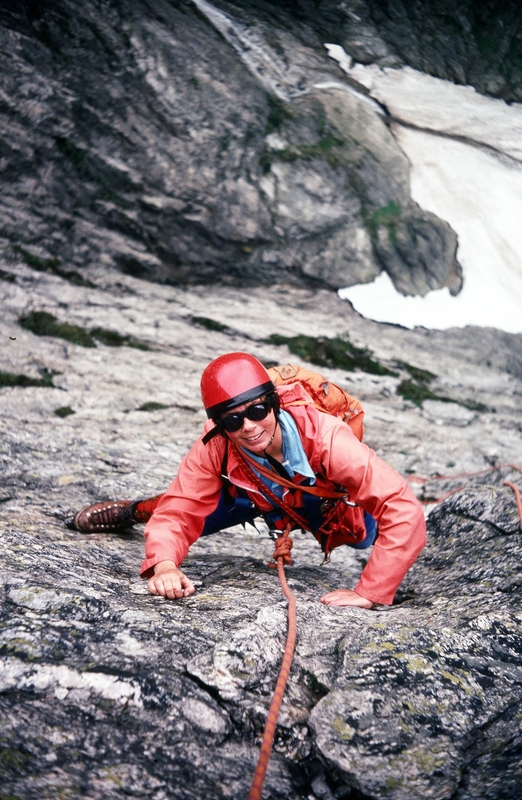 Mike enjoyed climbing, backpacking and skiing, but he had many other interests as well. For 25 years we shared adventures, mostly short trips that fit into his schedule, although we did go to Nepal and, in 1989, mount a private expedition to Baffin Island. It wasn’t until his death in 2006 that my passion for big, wilderness trips took over my life again and continues to rule it. 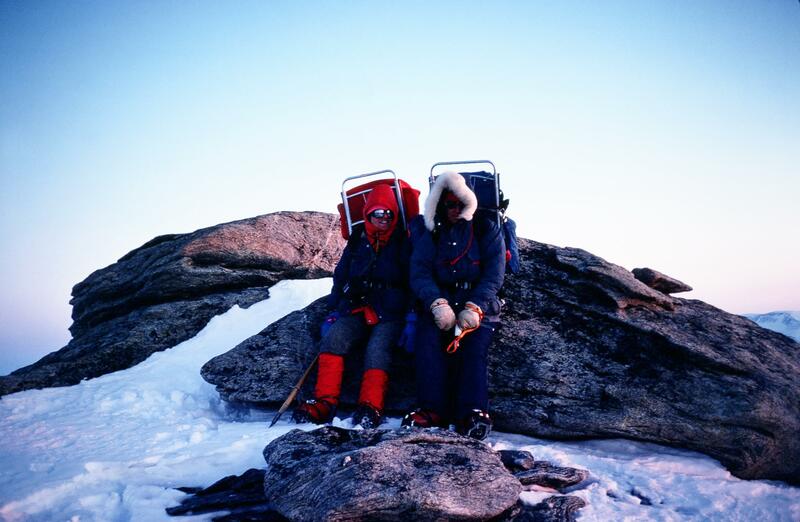 Fran and Ursula atop unnamed peak (first ascent), Ayr Lake, Baffin Island, 1979. 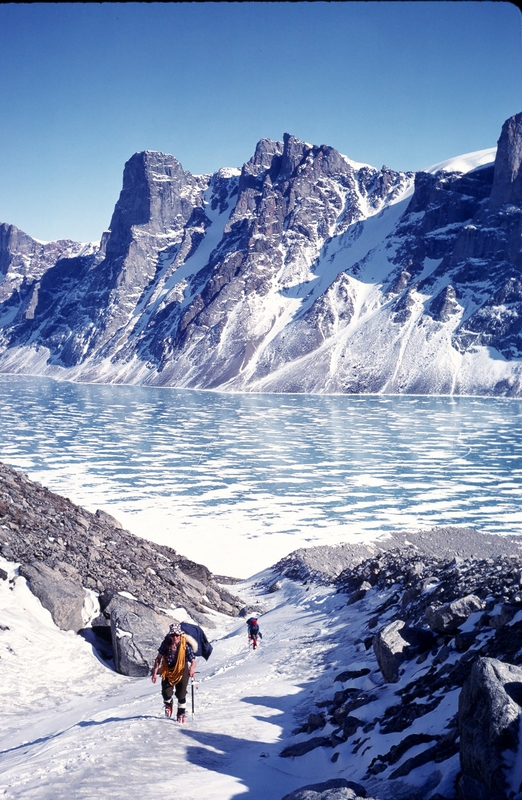 Ayr Lake on Baffin Island was the site of an Alpine Club of Canada camp in 1979. We flew into Clyde River, then had the local Inuit take us by snowmobiles and sleds to the lake, a gruelling trip in total whiteout. I remember at one point in the fog our driver said, “We turn left here.” As far as I could tell, “here” was no different from anything we had seen for the past few hours. I have a list of favourite campsites in my head: Floe Lake in Kootenay National Park, Nunalik Spit on the Beaufort Sea, high camp on Huascaran, etc. None of them equal our site on Ayr Lake. 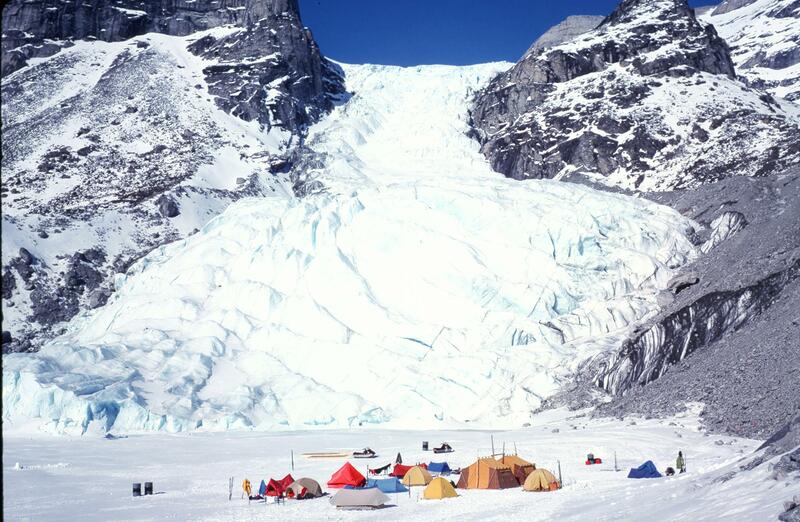 From our tents below a magnificent icefall we looked across the lake to sheer granite walls capped with snow and glaciers spilling down every gully. The camp was very much a do-it-yourself venture. We had a camp manager but no guide or cook. If we wanted to eat we went to the large food tent, took anything we liked and cooked it. With 24 hour daylight people might be eating breakfast at 1400 and dinner at 0500, depending on when they got in from climbing and slept. I think the manager was a little baffled as to what to do with the three women on the trip, but we quickly put his mind at ease by organizing our own climbs. The only comment he made was to ask the cause of all the giggles and loud laughter that reverberated through the mountains. Ayr Lake. Ursula, Fran and I begin a 28 hour tour. Our packs loaded with food for three meals, plus all our down gear, Ursula, Fran and I set out on our first tour, not knowing what we would find; the maps we had were sketchy at best and not to scale. Not exactly what we had in mind. We didn’t find anything climbable for quite a while. Undaunted, we mounted a small hill for a hero shot as the sun was setting. Our first peak in the moonlight. Later we caught the haunting sight of this mountain in the distance, aglow in the light of a full moon and a barely visible sun. “Let’s climb it!” And we did. There was a freedom here that I had never experienced before. What will we find over the next pass? There’s no need to hurry – the light will always be with us. So we wandered, pushed by curiosity, drawn by wonder until, exhausted, we made our way back to camp. 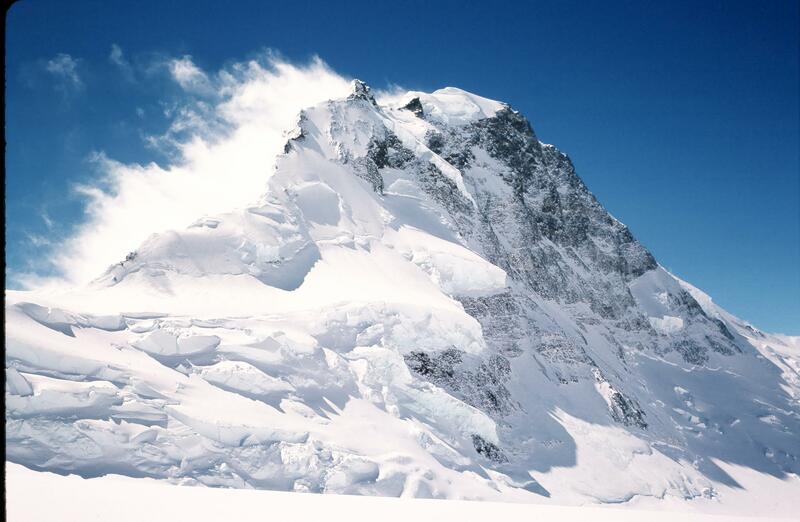 Our next venture was more ambitious: there was an unclimbed peak far down the lake that seemed to suit our abilities. 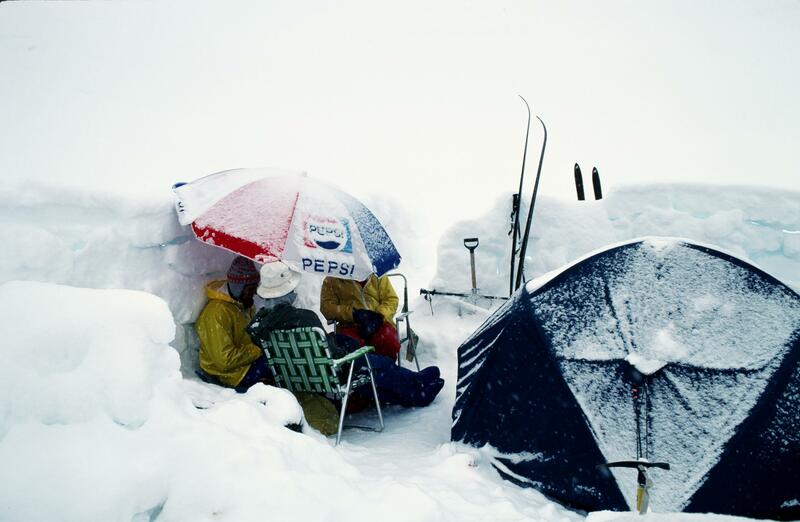 We would have to use a snowmobile and make a high camp on our own. Of course, none of us knew how to drive a snowmobile, let alone pull a sled, but Ursula was game to try. Ursula making a practice run with the sled. 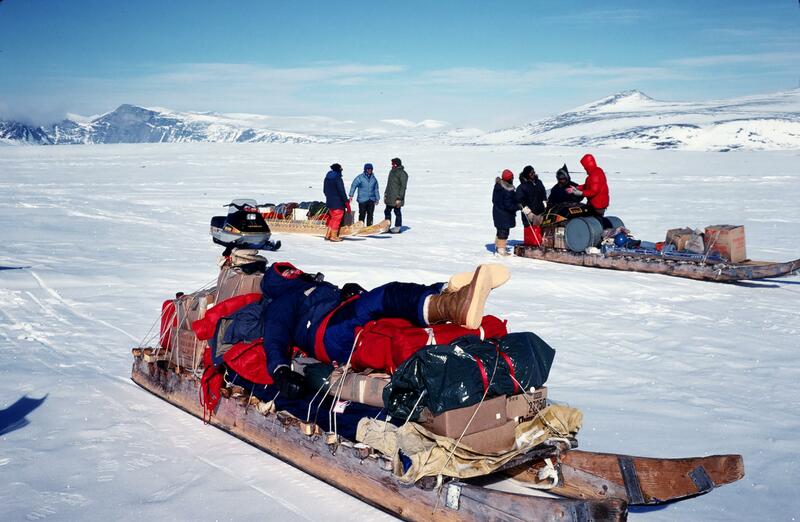 We loaded up, Fran sitting behind Ursula, me on the sled. 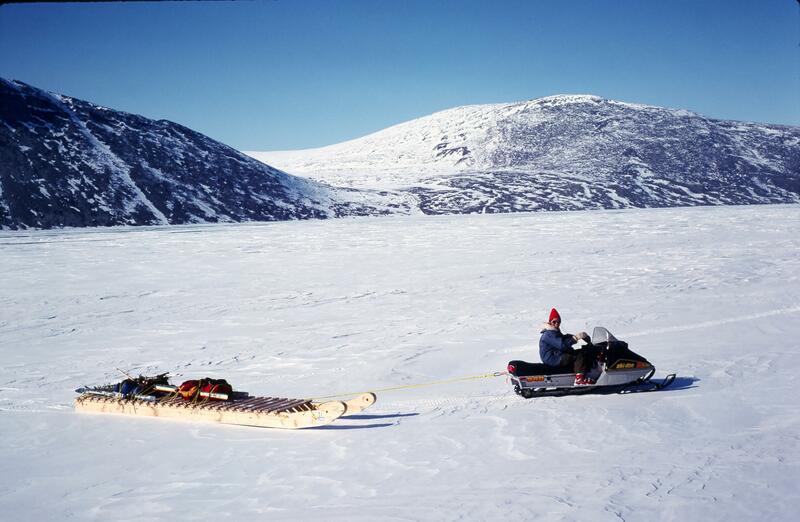 On the lake surface the sled had an alarming tendency to swing back and forth until it swung in front of the snow machine and sent me tumbling across the ice like a silly puffball. Nevertheless, we made it to the right valley and hiked in to the foot of the glacier that led to our mountain. Toe of the glacier. We camped very close to where Ursula is standing. We felt very alone in our tent. Every noise made us think of polar bears and the fact that the only gun for the group was back at base camp. 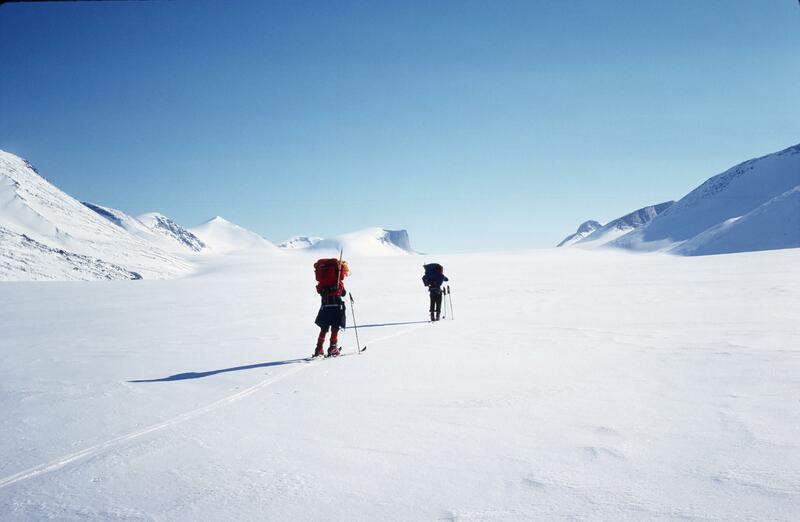 But next morning dawned bright blue, and we set off on skis. 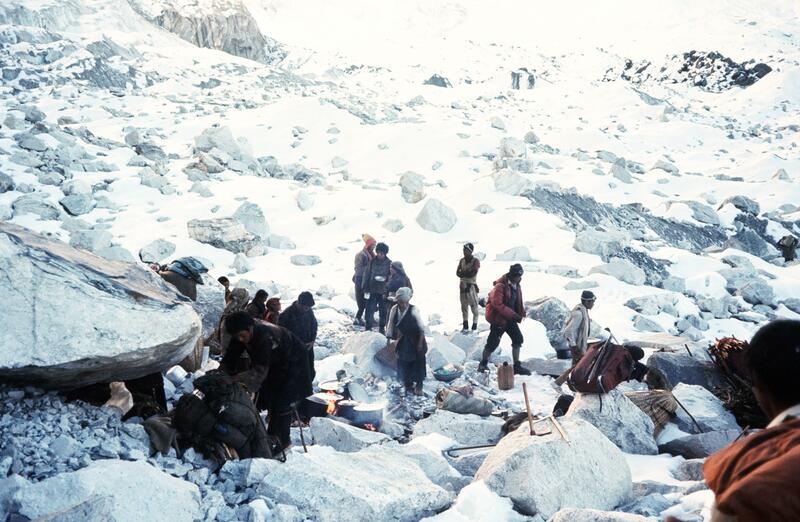 Our first task was to find a way onto the glacier, as the toe offered no access. We eventually found a side gully where crampons and a bit of struggle got us up. On the glacier. Our mountain is not yet in sight. 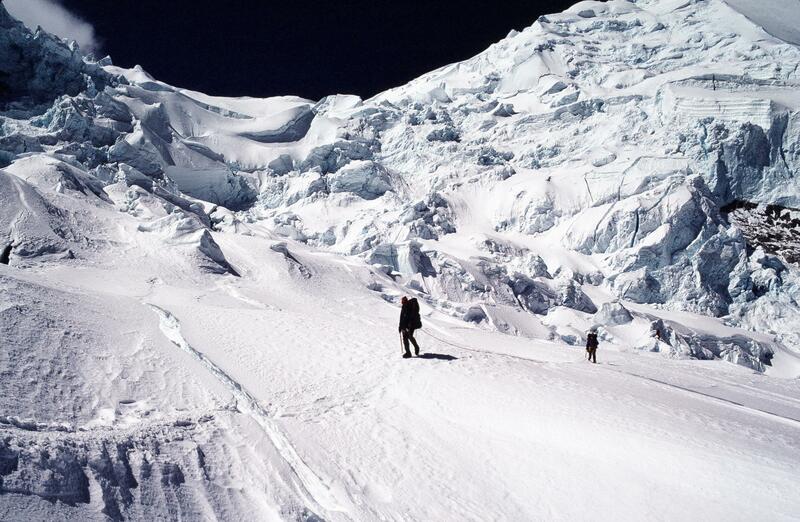 The glacier was so flat and tame that we didn’t bother to rope up; indeed, we never did see signs of a crevasse . Mid-day meal on a glacial erratic. Who knows from what distant mountain the glacier had carried this boulder over the centuries? It made a great lunch stop. Despite the sun the air was cool and we needed our down parkas. 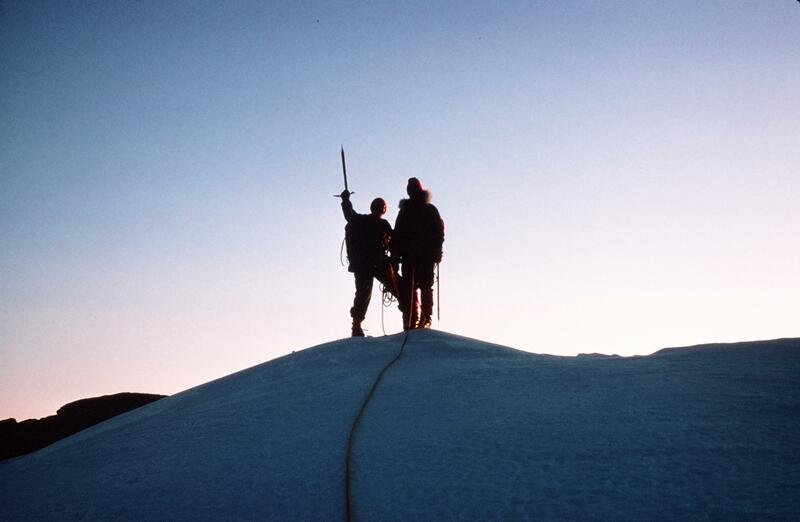 Hours pass and we round a corner to see our objective, a large white bulge with a small circle of rock on top. “Looks just like a breast,” chuckles Ursula. 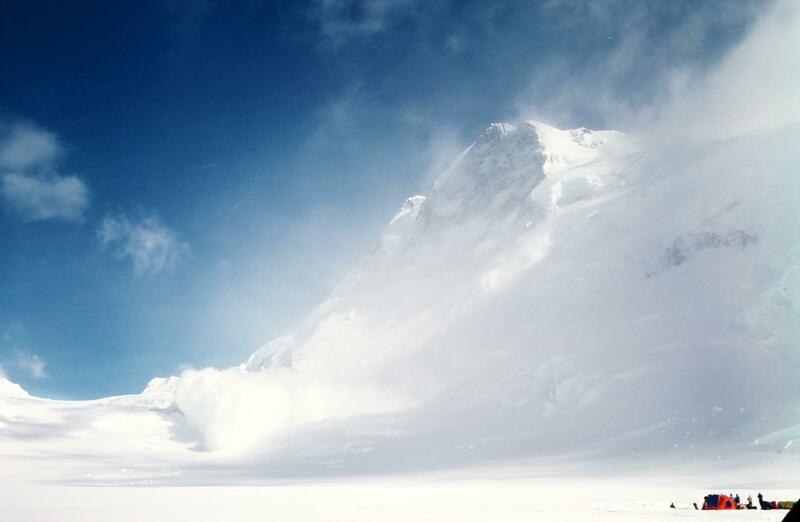 As the sun sinks to the south, we encounter sastruggi, snow whipped by wind into ice hard waves. It’s time to trade skis for crampons. On the slopes of our mountain. 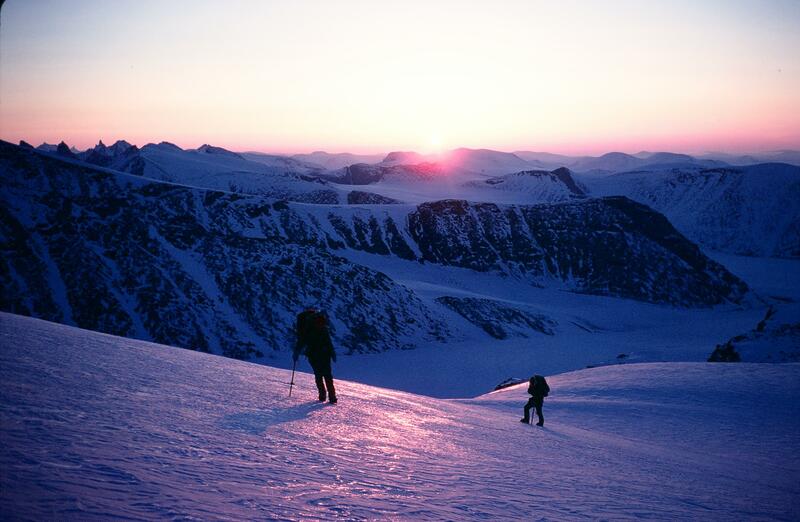 In the red glow of the setting sun we bend our bodies into a fierce wind and gain the summit. It’s no place to linger. We stuff a summit register under a boulder, pause for a photo and begin the long trek back to our tent. 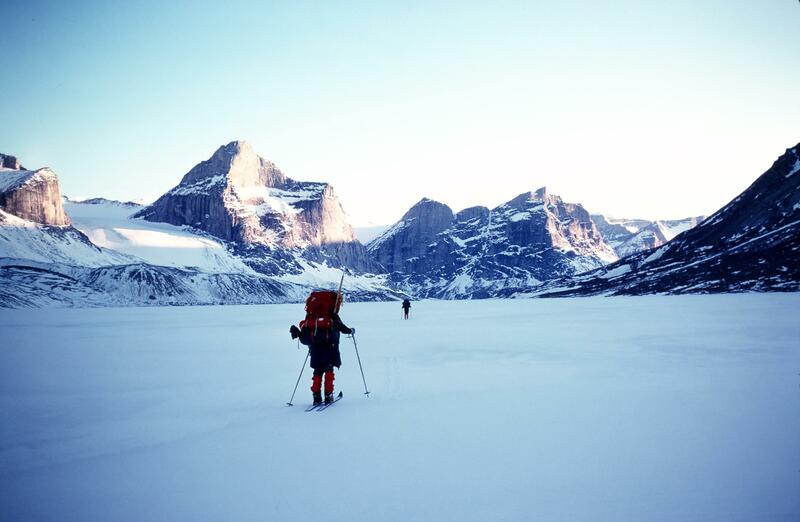 We made one more excursion from base camp – a traverse to Sam Ford Fjord, one valley over, down the fjord and back to Ayr Lake (which is an ancient fjord whose access to the sea has been blocked). We again used snowmobiles to go down the lake. In the background (centre right) you can see the glacier we ascended days earlier on our climb. The traverse involved some gnarly thrashing through deep snow in a boulder field and a tricky climb through water over ice to get back to Ayr Lake, but was otherwise simply a pleasant ski tour. Our camp manager thought that we could return to Clyde River on our own, but the Inuit said firmly that we would get lost. They came to get us, an exhausted but happy group of climbers and skiers. Shortly after Logan (see previous blog), I followed Eddie to Grindelwald, Switzerland, never suspecting that his guiding services might be fully booked. He had time for only two climbs, and our first objective was Monch, one of a magnificent trio that also includes Jungfrau and Eiger. The weather had been bad for several days so the early train to the Jungfraujoch overflowed with guides and clients. As we exited the station we found ourselves wallowing in fresh snow. All the other parties quickly turned back, but Eddie, using brute force, ploughed a path. On the ridge of the mountain Eddie was sometimes chest deep in snow, commenting that if we caused an avalanche, at least we would be above it. Still super fit from Logan, I followed him with ever-increasing joy. It was a beautiful day, we were on top of the world, and the mountain was ours alone. They called him “crazy Eddie” when we got back. So began one of the most memorable phases in my climbing career. Over the next four summers I climbed dozens of mountains great and small, far too many to include here even if I could remember half of them. I will deal only with those which were especially meaningful to me. Unfortunately I took very few photos in Europe and have lost almost all of them, but Wikipedia Commons provided me with some stunning views for this blog. Eddie returned to his clients and I met my new guide, Hans Muller. Small, quiet and cheerful, he gave no outward hint that he had done a significant winter ascent of the north face of the Eiger some years before. Hans decided to do Jungfrau, an easy snow climb but one that would allow him to judge my abilities. After that, he invited me to stay at his home in Kandersteg in a small cottage near the house. I soon became good friends with him and his wife, taking meals with them when we weren’t climbing. And climb we did: rock and snow, high peaks and short valley routes. 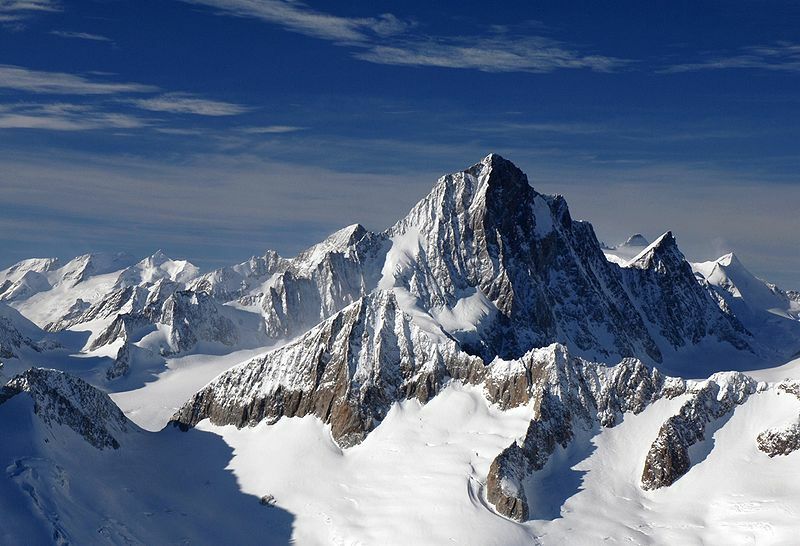 We climbed for one glorious month, during which the highlight was our ascent of the north face of Doldenhorn. 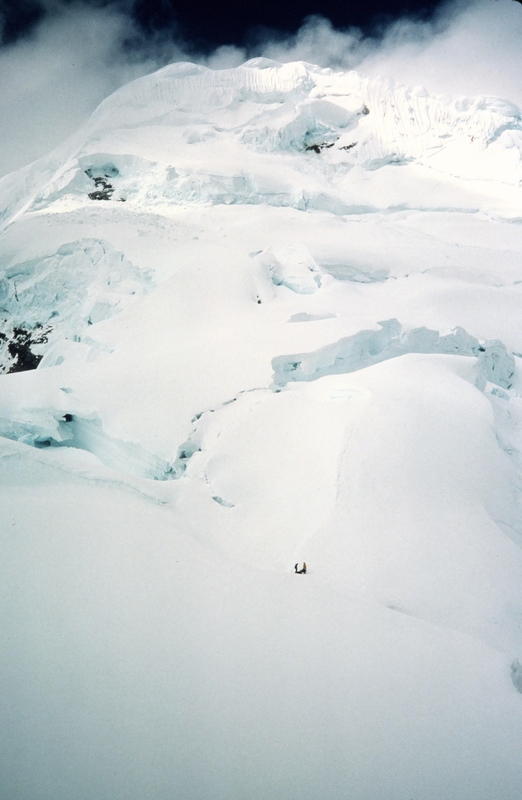 This was a steep wall of ice and snow, where Hans had to chop quite a few steps and most of the belay platforms. 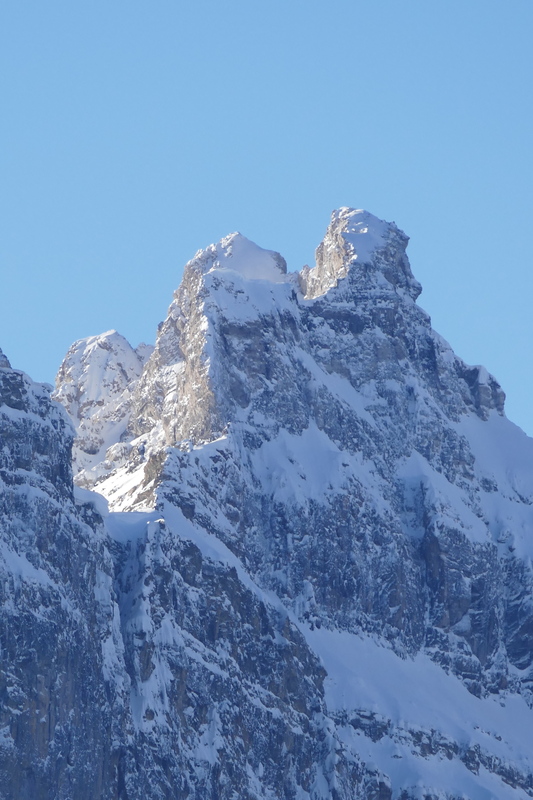 As the only north face of my career (weather would interfere with plans to climb two others in succeeding years), Doldenhorn remains as much a source of pride as Vorderspitze. If I had maintained the same level of fitness I had after Logan, I think that the following summers would have yielded more substantial results. But without a high-altitude prelude, I was far less prepared to do challenging routes. One summer, bad weather chased us around Switzerland and even into Italy, looking for something to climb in the rain, since major routes were not possible. 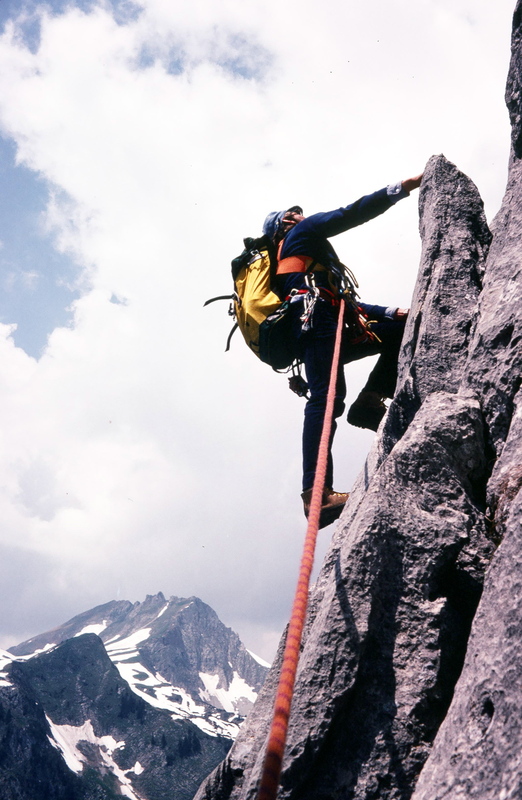 It is from this period that I have the only two surviving photos from all the climbing I did in Europe (not just with Hans, but also from earlier visits to Austria and the Dolomites). The most memorable, if not the most pleasant, climbs with Hans took place when both of us were injured. 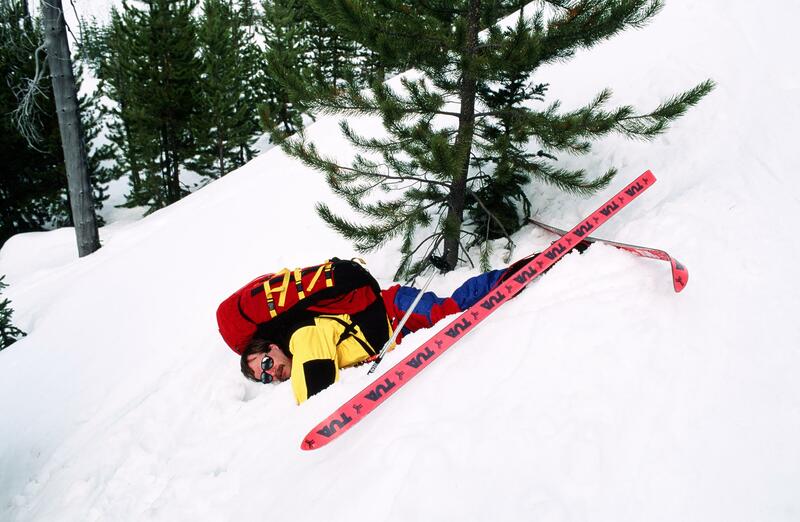 Hans had fallen, and although he had broken no bones, he was very stiff and sore. Since he could not guide me, he chose another guide to take me up the Finsteraarhorn, the highest peak in the Bernese Alps. We reached the summit, then spent the night at the Finsteraarhorn hut. Next morning, I sat up in bed only to have my lower back seize up in agonizing pain. Somehow the guide prodded me onto the glacier and down to the valley, where I caught a train to Kandersteg and the Muller home. For a week I could barely move, requiring 45 minutes just to get out of bed each morning.At last I decided that if nothing could ease the pain, I should at least try to do something I enjoy. I began walking, bought new climbing boots and told Hans that if he was ready to climb, so was I. So off we hobbled for a week that included Mont Blanc and Eiger. 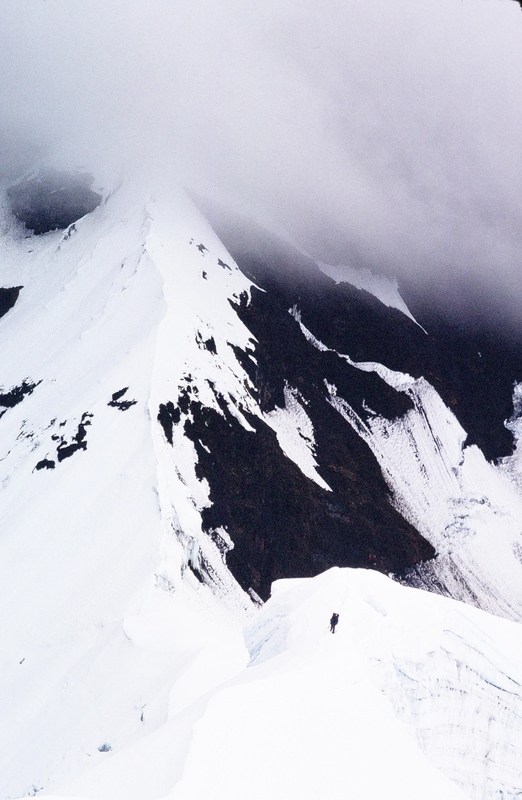 Amazingly, the mental focus required for climbing almost completely masked my pain; when not climbing, the pain was intense and sleepless nights were the norm. Our route on Mont Blanc began from the Tete Rousse hut, which is reached by a dangerous rock passage with frequent rockfall (to my mind, the most difficult part of the trip). A mixture of wine, schnapps and codeine bought me two hours of slumber, but in the morning the pain was bad and I was very slow to get going. Hans had to bring me my breakfast tray because I couldn’t carry it, and he put my boots on for me. 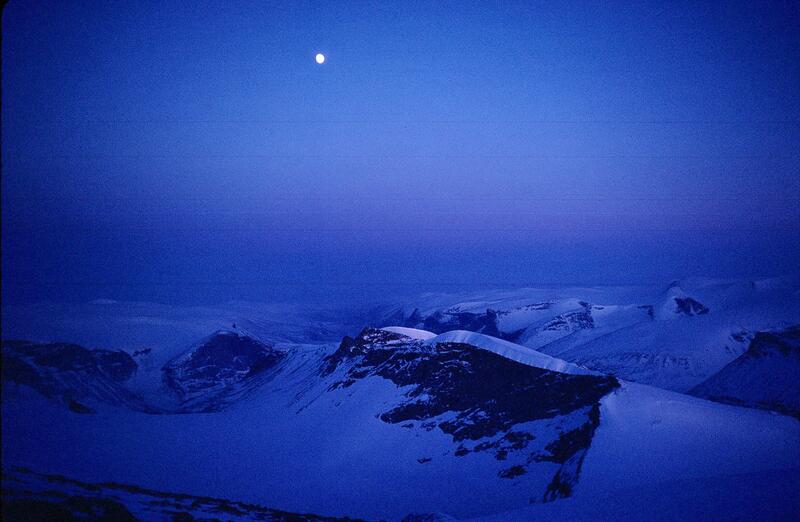 I think we left the hut around 0300, almost the last climbers to depart. On the snow slopes above us I saw a sight that is etched in my memory: a long chain of lights curving back and forth under a star-lit sky. The scene lacked only the Humming Chorus from Madama Butterfly to be complete; indeed whenever I hear that music I am back at the hut, enchanted by the beauty. Hans set a very slow but steady pace. We began passing other parties, then more and more, until we were among the very first to reach the summit, just in time for sunrise. The Mittellege ridge on Eiger is a steep, very strenuous and exposed route that I consider the most beautiful and entertaining I have done. The climb begins on the Jungfraujoch train, which burrows through the inside of the Eiger for much of its journey. Climbers exit midway, into the rock core, and follow a narrow, snowy tunnel to a door that opens onto the back side of the mountain. 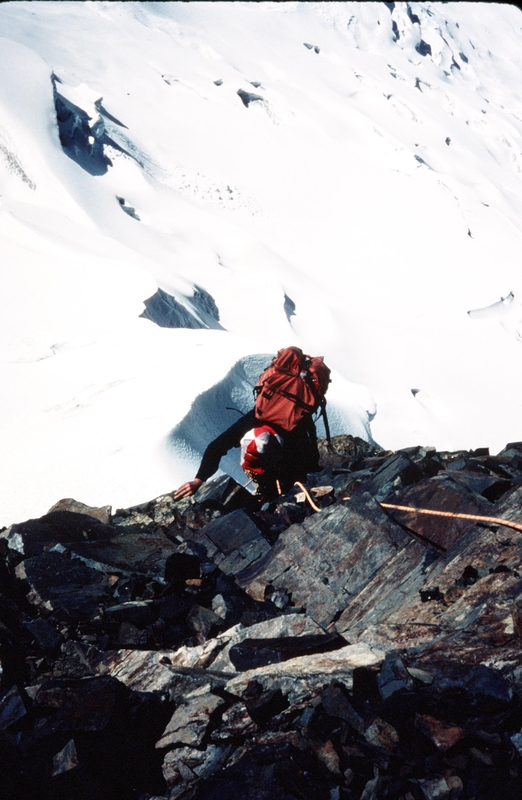 From there some exposed scrambling leads to the Mittellegi hut, perched precariously atop the ridge. In good weather the climb is very popular, so popular that I had my first experience of people passing through our rope (apparently it’s not that uncommon in the Alps). I would reach for a handhold only to have someone’s foot get there before me, without so much as a word of warning. After a few pitches, however, everyone had passed us. 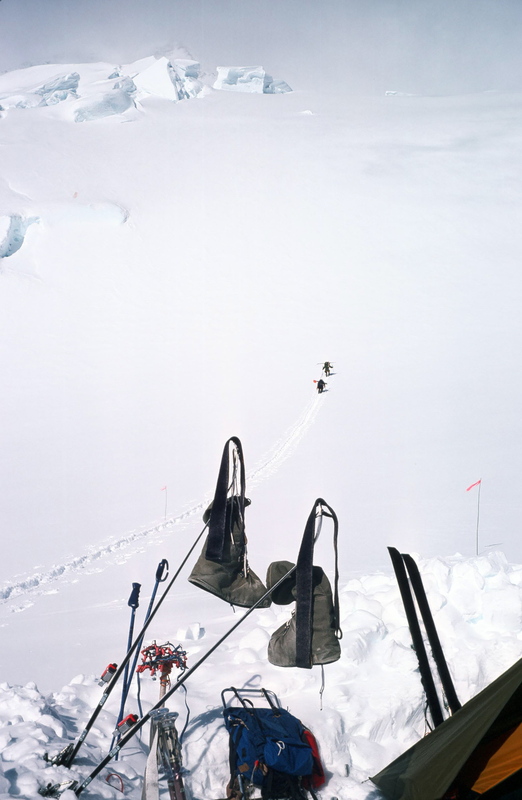 The steepest sections of the ridge have fixed ropes; the arm strength required to haul oneself up is exhausting, and the ropes seem to go on forever. When my face wasn’t plastered to the mountain, I could look straight down into the valley, thousands of feet below. On this narrow, airy ridge one should dance lightly, tied to the earth by nothing more than secure technique. I could not dance, but even while gasping for breath and struggling to raise myself onto the next foothold, I understood the elegance of the route. And when I stood at last on top of the Eiger, it was awe, not pride, that I felt. To be there was a privilege undreamt of. 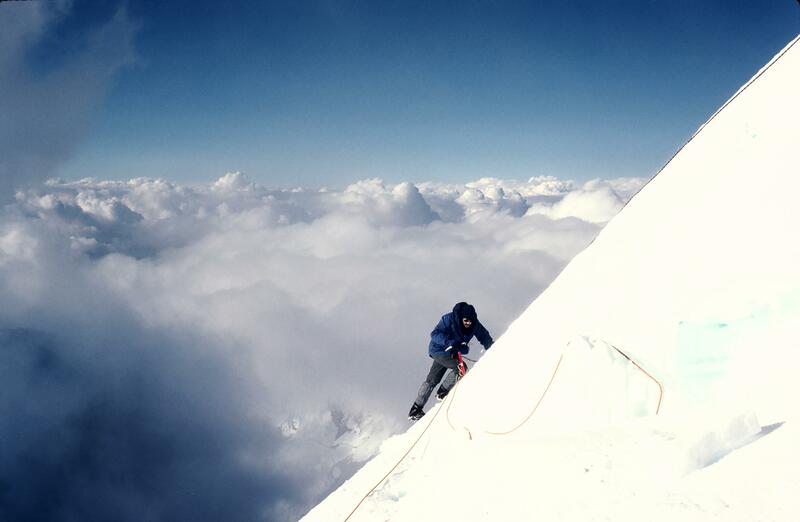 I returned home shortly after Eiger and never climbed with Hans again, although we did ski the Haute Route a year or two later. After a couple of months of yoga classes, my back stopped bothering me, and has given only occasional trouble since. 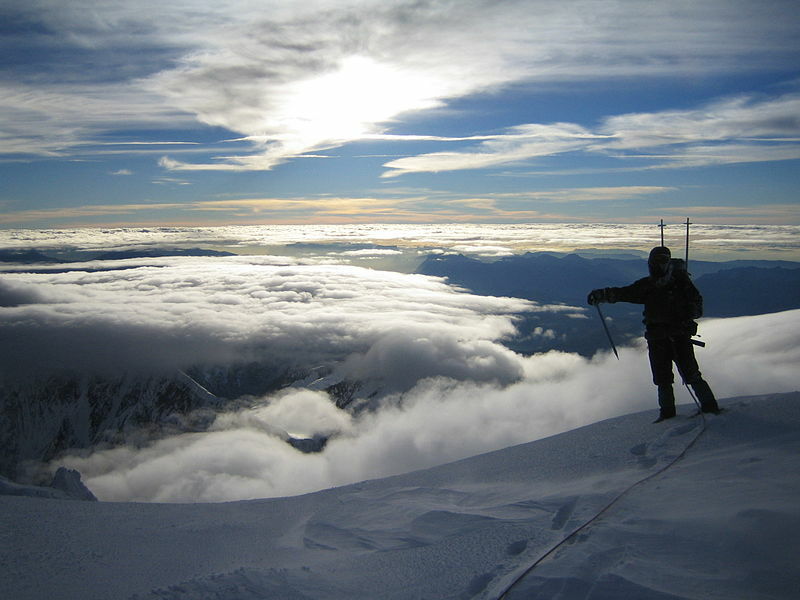 After the tribulations of Denali, it would have been easy to give up on high altitude climbs. 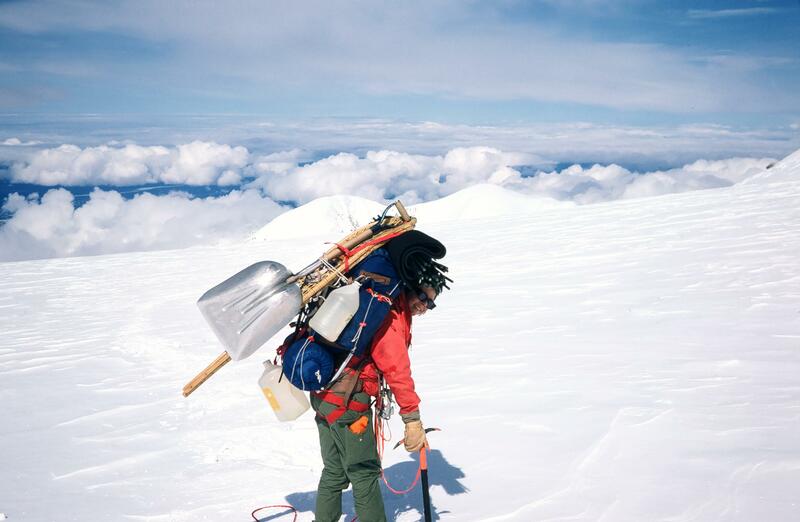 Why be a pack mule, subjected to constant abuse by a martinet leader, only to arrive on a summit from which the view barely extends to the length of one’s arm? 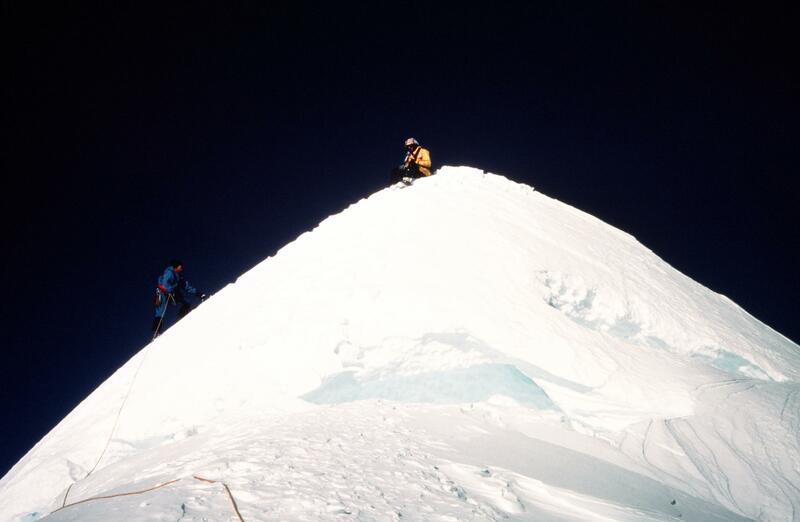 Still, I had achieved the summit when more than half in our group had not. There was no sense of triumph on top; rather I remember thinking, as I gazed into the mist, “Is that all there is?” But later, the lure of altitude, the sense of being totally isolated from the valley dwellers of the world, the unforgiving glimpse into my insignificance in the universe drew me back to the big mountains. Ursula, John and I were active members of the Edmonton Section, Alpine Club of Canada. We wanted to climb Mt. 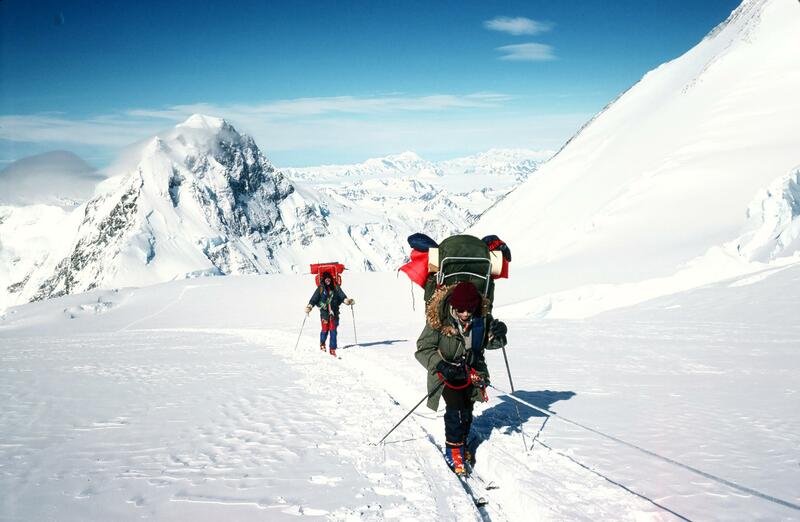 Logan, the highest mountain in Canada, but needed a fourth climber to make a safe party. During a ski mountaineering week with Canadian Mountain Holidays we spoke of our plans with our guide Kobi. He said that he was planning an expedition to Logan with some fellow guides and would welcome us as participants. And so we found ourselves on a trip with four professional guides for which we were paying only our food and transportation. Ursula and I made it to the east summit, which is not the highest point, but is plenty high enough. With such good companions and leadership we thoroughly enjoyed the expedition. Even more important to me, I used this trip as a springboard to the Alps, where I was to do the most memorable climbs of my career. Logan is a monstrous mountain, so huge that it fills the entire front window of our bush plane. Our route was the King Trench; it’s the easiest on the mountain but it offers more objective danger and technical difficulties than the route I had done on Denali. 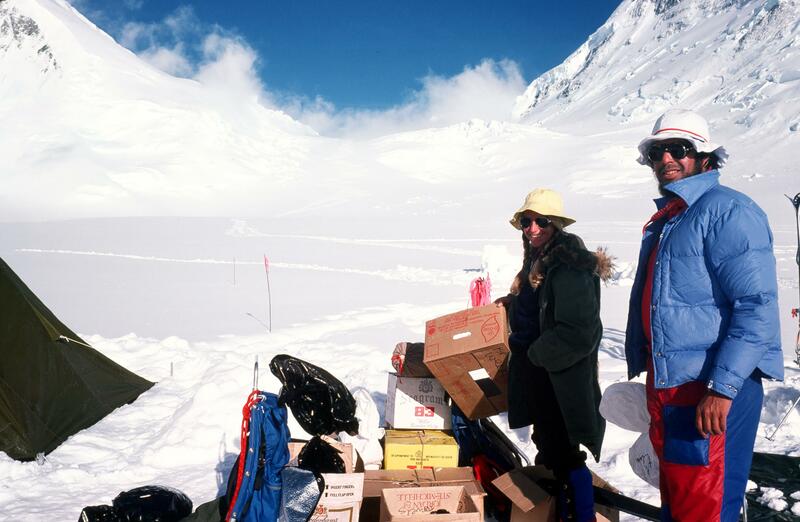 Above, Cathy, our cook, and John organize the massive load of food and gear we must take with us. 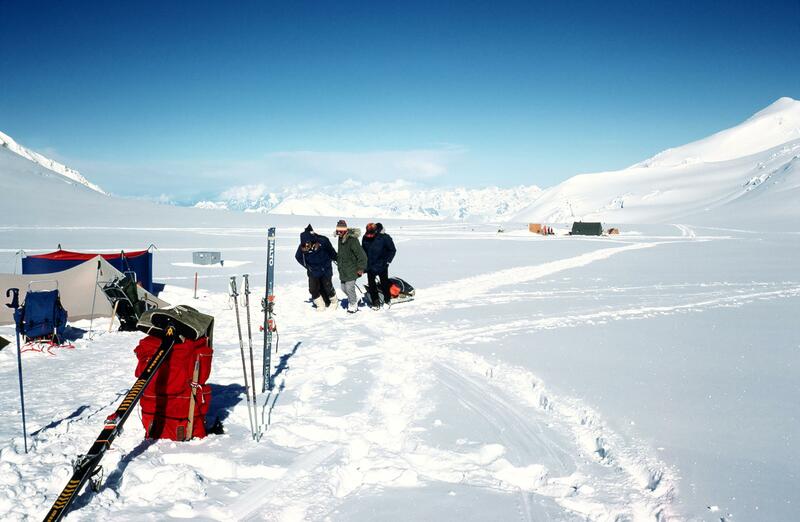 We begin to carry loads to a camp on King Col (above with King Peak), skiing down each day to sleep at base camp. One afternoon a massive avalanche roars down and covers the tracks we had made in the morning. King Peak is a magnificent structure, arguably the most beautiful part of Logan. Forging the route from our camp in King Col.
On the lower parts of the climb we need two or three days to establish the next camp, carrying loads high but sleeping low in order to acclimatize. Of course we have to act as pack mules; that’s the reality of a trip like this. Somehow the fine weather and majestic scenery, which is almost Himalayan in scale, make one forget the load on one’s back. Eventually Logan’s fiendish weather catches up to us and we spend a few days trying to keep from being buried by snow. When the sky clears, we continue our carries. Sometimes we leave a cache halfway between camps to shorten the distance and time required to move the load. In many places we must dance with enormous crevasses. 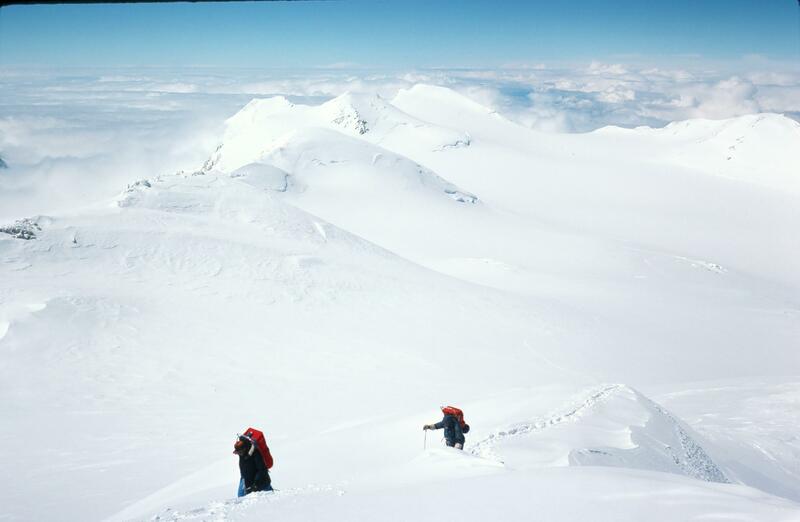 Our goal is a gigantic high plateau which gives access to all of Logan’s summits and which also serves as a research base. Kobi has come to do a construction job for the research station (seen in the background), after which he plans to climb the main summit. 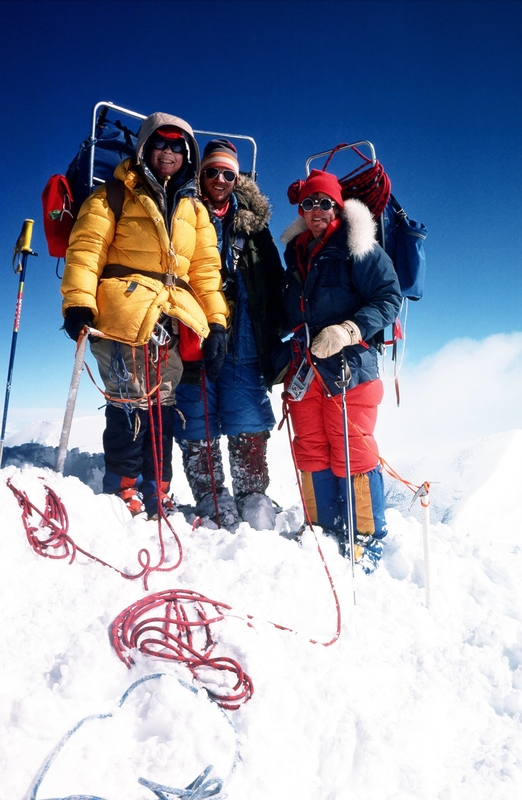 Meanwhile, Ursula, John and I will try to summit with Eddie, one of the guides. 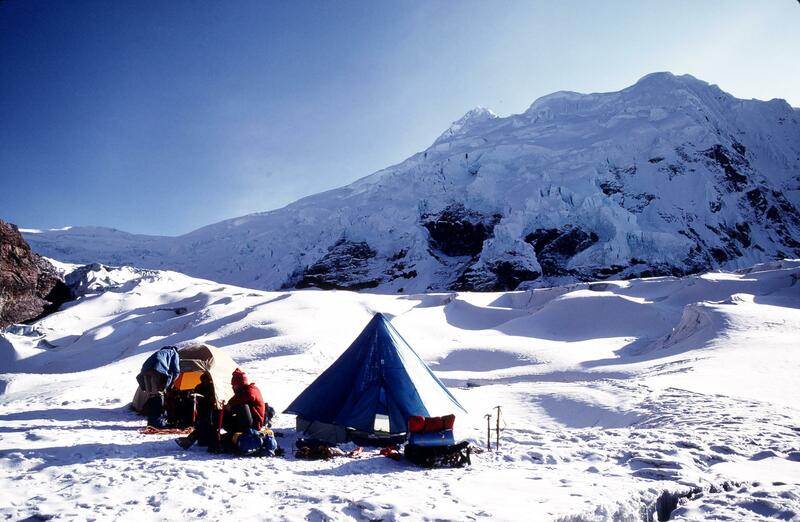 Because of Kobi’s project, however, our camp is at the far end of the plateau from the main peak. Lying in my sleeping bag I know that the outside temperature is bone chilling. That means clear weather and a good day to go for the summit. It takes all of my courage to emerge from my down cocoon into the -36 degree cold. We set off at a good pace, but after an hour or two John is having trouble and decides to return to camp. Eddie ploughs a track through the snow for Ursula and me, and slowly we gain elevation. Ursula nearing the east summit. At last Eddie stands atop the east summit and brings Ursula and me up to join him. 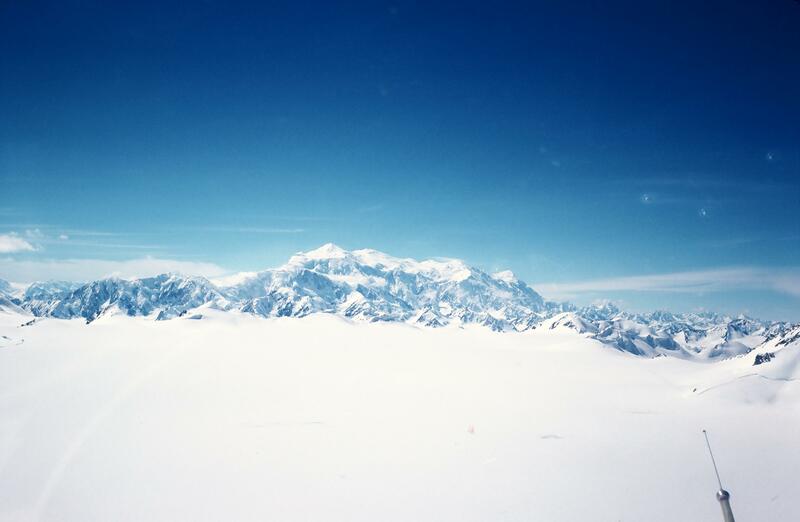 We gaze in awe at the mountains of the St Elias range, now all below us. 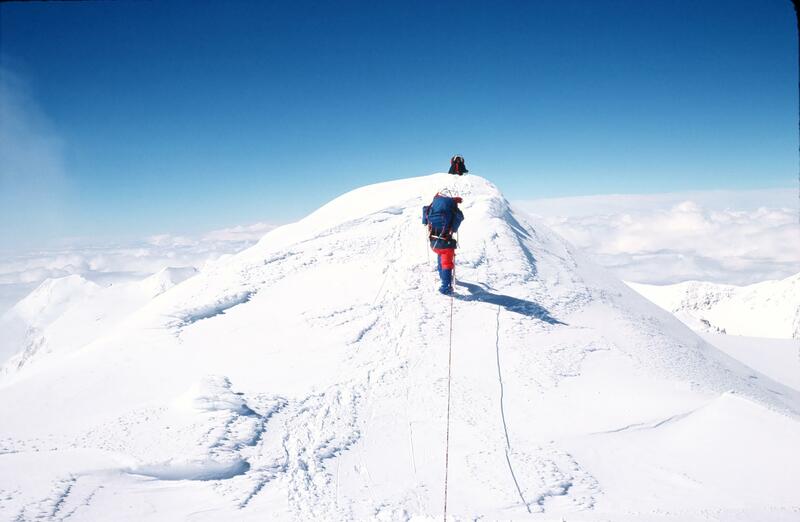 Across a crevasse-riddled flat area we see the main summit, too distant and too hazardous for us. 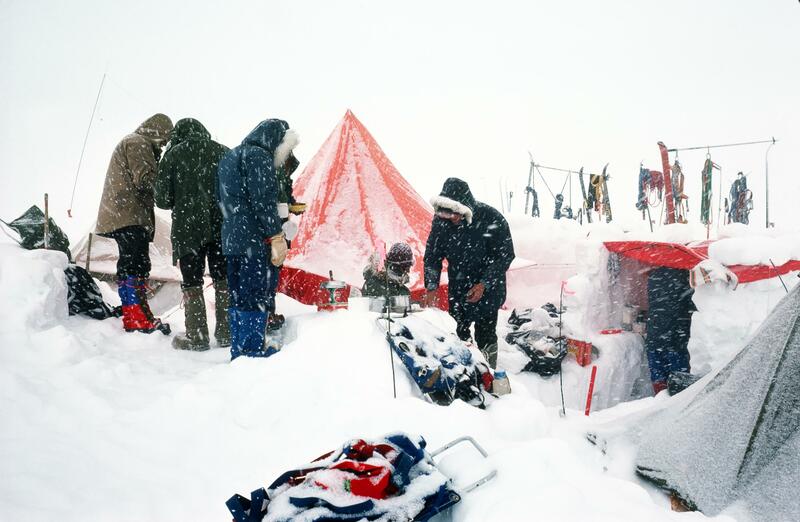 We are already far from camp and will need all our determination to make it back in the harsh cold. Eddie serves up some schnapps, and then we start down. 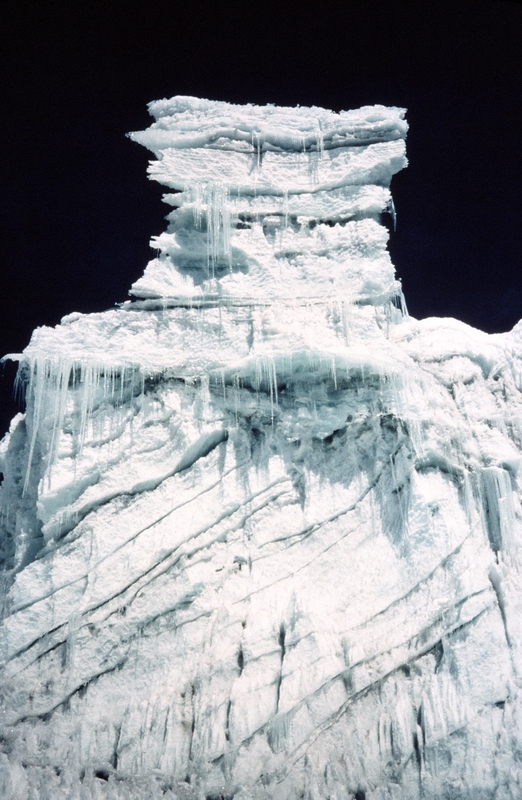 John developed frost bite and also showed signs of high altitude cerebral edema; he was flown out from the high plateau, spent some time in hospital, but suffered no permanent damage. 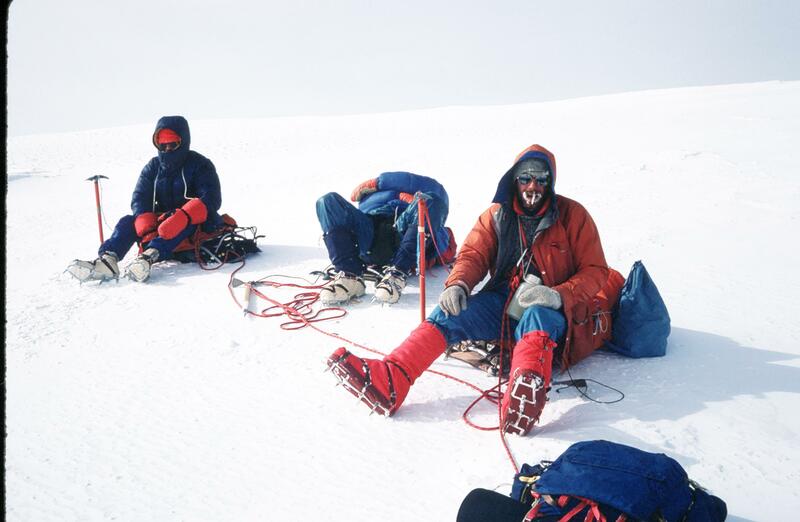 Eddie joined Kobi on his project, while Hans Peter was delegated to take Ursula and me to base camp. We spent almost a week there waiting for good flying weather. 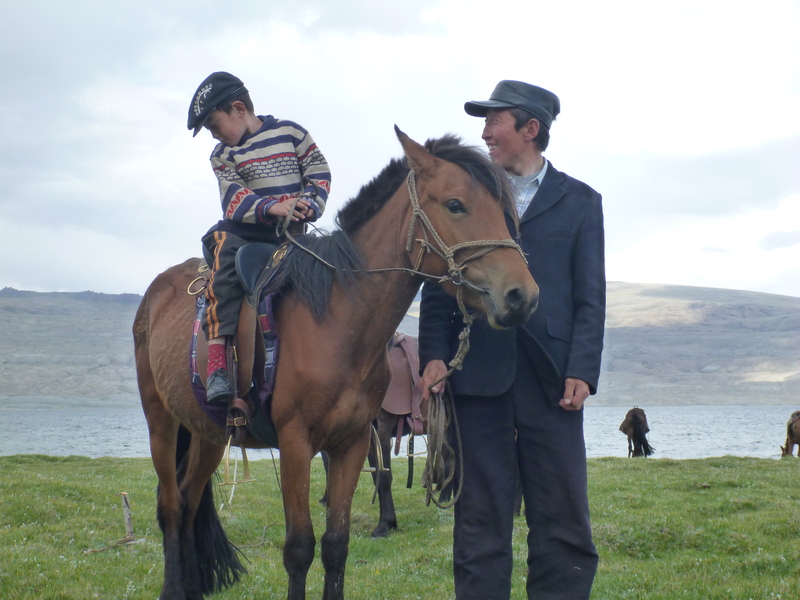 Kobi and the others arrived, having completed the project and climbed the main summit. Hans Peter and I remain friends to this day. I joined Kobi on several more ski and climbing camps and still see him occasionally in Banff. Eddie returned to Switzerland to resume his guiding career there, and I decided to fly over in hopes of hiring him for some climbs. It was to be one of the best decisions I have ever made.